Cuddles, who had recently been rescued form a local shelter with his brother Mishko, is feeling much better. He is improving slowly. What a darling boy, this fellow has beautiful posh white fur, with sky blue eyes. He is such a wonderful bunny boy. A family in Pennsylvania wants to adopt him and are arranging to have him air transported to their home. Yesterday we began nebulizing again. He needs to be totally stable before he goes anywhere. Recovering from the loss of Mishko, this family decided that they are adopting yet another special needs bunny! I love this family. I hope Misko is watching us from the land of rainbows - if he takes time out of all his joyful play! I am keeping my promise and doing everything possible for Cuddles. It is with heavy hearts that we must tell you the sad news about Mishko. He could not manage life any longer, and crossed the rainbow bridge today. He tried all he could. He was so accepting and seemed to understand we all wanted to help him. The vet did all he could, truly a remarkable effort. Yet Mishko was so devastated with bone disease - he literally had no lower jaw bone left. While he was in the vets office today prior to his scheduled surgery, he died. May this beautiful, gentle bunny find peace and comfort in the land of rainbows, A kind of joyful, sweet life he did not seem to find on earth except for a few hours of love and kindness with us. He was holding on this morning. He sat and kissed his brother. I knew something was different. I think his brother knew too. He ate his pumpkin slurry happily, calmly looking at me. He got his fluids and meds, but he was much calmer than yesterday. I hoped he could have his surgery and he could begin the road to being well. I told him to hold on, that he'd be well soon. I held him and gave him a nice bath to clean up his face for his big day He liked that. Fluffing up is what we call it. 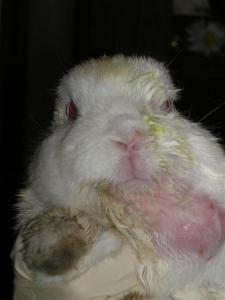 What a loving bunny, so very gentle, truly living each moment, soaking in love. But after days of Pen G, antibiotics, Buprenex and hot packs, He had been through enough - he left. I was holding him in his soft blanket as he crossed into the land of rainbows. We had planned to have his big surgery this morning, but that was not meant to be. He was far too ill, the infection in both lower jaw bones had eaten away his bone. There was hardly any jaw bone left on either side. Most of his lower teeth that remained were jutting inside his mouth. It must have hurt terribly. His vet had never seen such a horrific jaw infection. He said it was most likely just an injury left untreated. Mishko could have survived, if someone (his humans) had taken care of him when he needed help in the beginning. This morning I thought he was starting to improve. The abscess (4+ inches) had receded some this morning, but at the vet's office we we discovered he was badly anemic, his body ravaged with infection. Clearly 2 pound underweight. His oxygen rate was Very low 45. It should have been 90 - then the x-rays showed us all the bitter truth. I am sad that Mishko never had the chance to meet his new parents waiting for him in Pennsylvania. They will be heartbroken. Last night they called to say hello to him on the phone and wish him success with his surgery! I wish he could have know how wonderful it is to have ongoing love and a family of his own. For Mishko, I know is it best that he is not suffering, but it hurts to have lost him. I wanted more for him. I always think of the very best for each one of our little ones. I loved him, precious little blue blue eyed boy. So, now he is off on his final journey and I will hope he will visit us in sprit. I am thinking of him being completely pain free and truly happy in the land of rainbows so how can I be sad about that? His brother said goodbye sweetly nudging his head as if to rouse him. He licked his face and when there was no response he came to my lap and just sat with me while. He is ok now but quieter than I'd prefer, So my focus moves to him next. Please light a little candle for Mishko and send a positive happy thought for his passage. We were informed by a shelter that two rabbits (brothers), were in need of immediate rescue. The rabbits were both sick, and needed care right away. I could not just leave them sitting in such misery! Their names are Mishko and Cuddles. 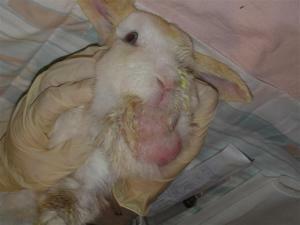 These rabbits are suffering from horrific injuries and neglect. I have seen many injuries in my 20 years and this is one of the worst. The Haven will give them both every bit of emotional and medical support we can. They are both in critical condition - Of course we are going to do all we can and they need your help too. They are both so beautiful. These are gentle bunnies. It is so hard to imagine how they ended up in such horrible shape. Mishko is a lovely, boy, gentle as rain and loving too. Pure white with lovely sweet blue eyes, he is doing his best to keep his spirits up and to eat. The huge abscess has grown so large on his face it almost pulls him down. It is difficult for him to put his head up - today his vet recommended that the huge double abscesses be removed. It will be a long, difficult surgery. We estimate his care will run over $1,000.00, but he's worth it. He is on every imaginable medication. I haven't even looked at the bill for that. Both of these adorable rabbits were "found" stray. I get so upset when people treat their rabbits with such callus disregard, then when they feel like it, they dump them at a shelter saying that they are "stray". Most likely they bought the rabbits at some idiotic pet store and just dumped them outside when the bunnies were not cute babies anymore. This is the result, just look at the pictures. How could someone do this to a beautiful animal? We'll have more pictures of brother Cuddles tomorrow. He is perfectly white with rex mix fur and ice blue eyes that look at you intensely, yet gently. He is fighting a respiratory infection and has difficulty breathing. We are hoping for a full recovery once his medications start to work. His medications, Penn G and Baytril will run over $70 for the projected 1-2 month treatment program. We'll get new x-rays after his treatment to see what other medications or nebulizing he might need. Please wish them well, send healing energy and if you can spare even a few dollars send it along to them via Paypal, or by check. We will need some support. Mishko will be in critical care for weeks. Surgery to remove the abcesses is set for this Thursday May 10th. Wish him a successful surgery and a speedy recovery. They count! No bunny deserves this torture. Everybunny like these deserves love, support and our care.